Nagpur, september 26 : Universal brotherhood is not just an emotional concept, but a vision of the strong person who wish welfare of all. The concept was propagated by Swami Vivekanand, who believed in physical and mental strength for a peaceful and satisfied society in the world. This was stated by N Krishnamoorti, a dedicated fulltime worker of Vivekanand Kendra, Kanyakumari, Nagpur Centre, on Monday. Krishnamoorti was delivering a lecture on ‘Gauravmay Bharat Ka Aadhar - Vishvabandhutva’. Col Sunil Deshpande, President of Prahar Jagruti Sanstha was in the chair. 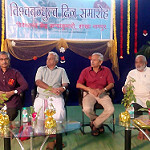 Life member of Vivekanand Kendra Vishwas Lapalkar and Dr Jagdish Hedau were seated on the dais. Krishnamoorti said and added, the economy improves and remains stable, where people live together and care for each other. There was no standing army and everyone was ready to fight for the nation, when ever required. He advised the youth to become mentally and physically strong and work with positive approach. The history of any nation is stories of a handfull of strong persons with very strong self-confidence. Several economists and philosophers have appreciated the strength of Indian social structure, which makes it a strong nation. With several aggressions efforts were made to break this social system and wisdom of people. The nuclear test in Pokharan again demonstrated strength of the nation, which the world recognised. Krishnamoorti appealed to the youth to read and understand Swami Vivekanand’s philosophy and work with self-confidence and determination. In his presidential address, Col Deshpande spoke briefly about ‘Prahar’ and his experiences as an Army Officer. He also emphasised on having self-confidence and determination for positive work. India has one of the best armies in the world. He appealed to the people to have faith in Indian Army and support it. were attending Sanksar Classes of the Kendra, were felicitated on the occasion.